"Overview of Plantronics Manager Pro Security"
Plantronics takes security seriously and understands how important the responsibility of safeguarding data is to the customers, and takes comprehensive measures to protect them. Plantronics contracts with respected security firms who perform regular audits of the Plantronics Manager Pro services to verify that its security practices are sound, and to monitor its services for new vulnerabilities discovered by the security research community. 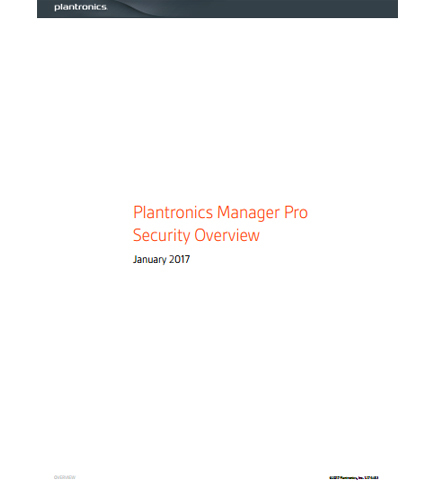 This whitepaper gives an overview of Plantronics Manager Pro Security and its different practices. Radio Access Network (RAN) virtualization is a highly disruptive technology that will radically impact how wireless services are delivered. It will change the current ecosystem and market structure. RAN Virtualization will allow mobile operators to provide greater value to win and retain customers, reduce production cost per megabyte, and utilize available resources more efficiently. This whitepaper discusses the benefits and uses of RAN virtualization, and outlines how RF Router enables RAN Virtualization. Major trends driving in-building and high traffic density zone wireless Total market potential for equipment employing RAN virtualization RAN virtualization defined RF distribution enabling the concepts of a virtualized Radio Access Network architecture Virtualization is altering the way MNOs plan and roll out new services by providing a scalable, on demand alternative to the traditional architecture.